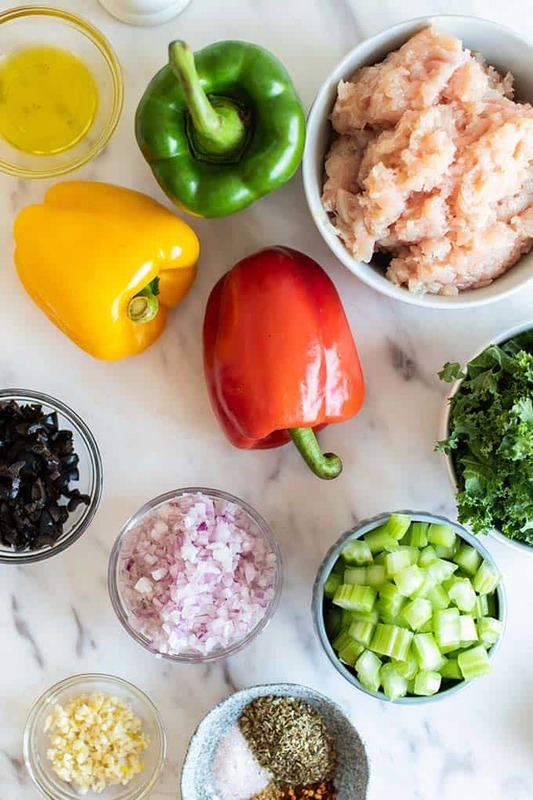 Learn to make the best Stuffed Peppers. 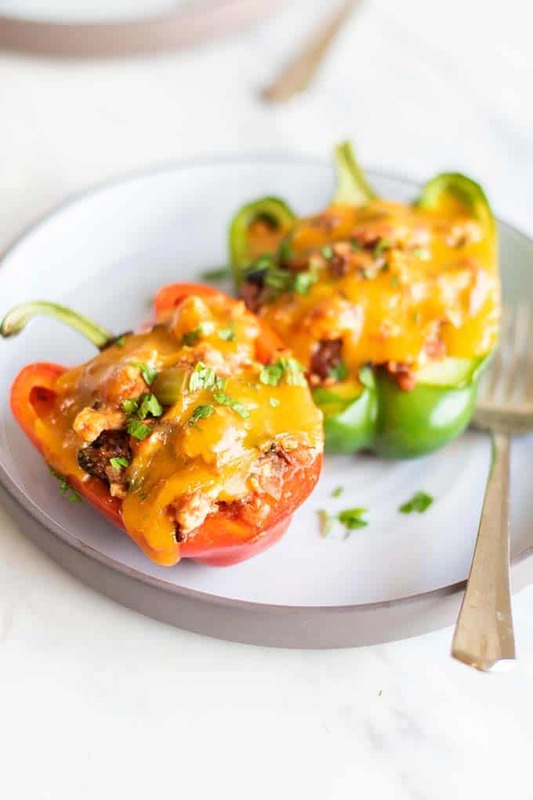 This healthier stuffed bell peppers recipe uses ground chicken or turkey, and whole grain rice, and is topped with a melty layer of cheddar! Bell peppers make the perfect vessel for stuffing! I remember my mom making stuffed bell peppers, and she stuffed them with ground beef and rice. Ground beef is a good choice for these, but I prefer ground chicken or turkey. Use whatever meat is your family’s favorite (or whatever you have on hand!). I like adding rice to mine also. For this recipe, I used a brown and wild rice blend. But again, this is customizable! Use white rice, brown rice, or even quinoa. 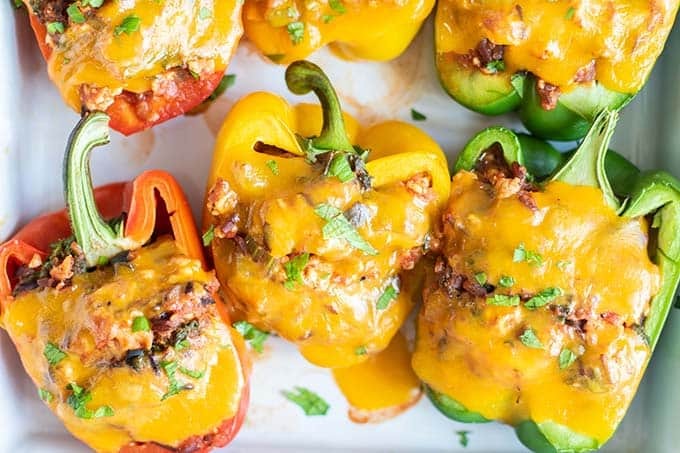 If you want to make these grain free stuffed bell peppers, use an extra 1/2 pound of ground meat and just omit it! After halving and seeding the peppers, bake them at 425º F for 15 minutes to soften. While the peppers are baking, make the filling by sautéing veggies and ground meat with an easy tomato sauce. Stuff the peppers with the mixture, and top with a slice of cheddar cheese (pretty much NOT optional!). Return peppers to the oven for 15 minutes. Serve — a complete meal all on its own! These are another favorite for meal prep. I love them, and so does my family, and they are a healthy one-pan meal. It’s so easy to put these together and bake them in my Sharp Superheated Steam Countertop Oven. The oven doesn’t need preheated – it turns on instantly, and then it bakes in 2/3rds the time of a conventional oven. Hello, timesaver! I love kitchen hacks that accommodate my lack of pre planning. As the weather warms up, I am reminded of last summer when I received my Sharp Superheated Steam Countertop Oven. The weather was so hot, and normally, I wouldn’t have been baking — but this oven does not heat up the house like a typical oven. While I use it year round, it’s a life saver in the summer. Choose your Meat: Ground beef, turkey or chicken work great in these. Make these Vegetarian: Omit the ground chicken, and double the amount of rice. A handful of chopped walnuts make a great meat-free addition. Make these Grain Free: If you need these to accommodate a low carb, keto, or grain free diet, omit the rice and add an extra 1/2 pound of meat. We have made these grain free and they are just as delicious! Don’t have Kale? : I love celery and kale in these peppers to add some extra veggies. If you don’t have these on hand, omit, or sub chopped carrots, broccoli, or spinach. 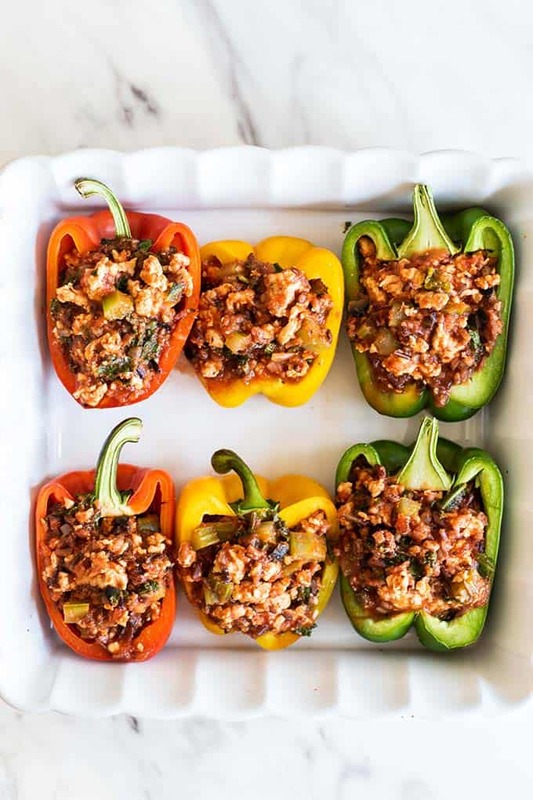 A delicious healthy meal made by stuffing bell peppers with a mixture of meat, rice, and veggies simmered in a tomato sauce. Top with cheese for a family favorite! 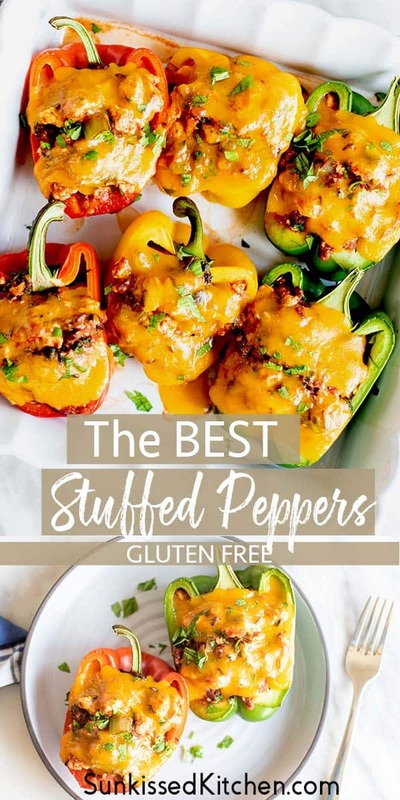 Slice and deseed peppers, and place in a baking tray. 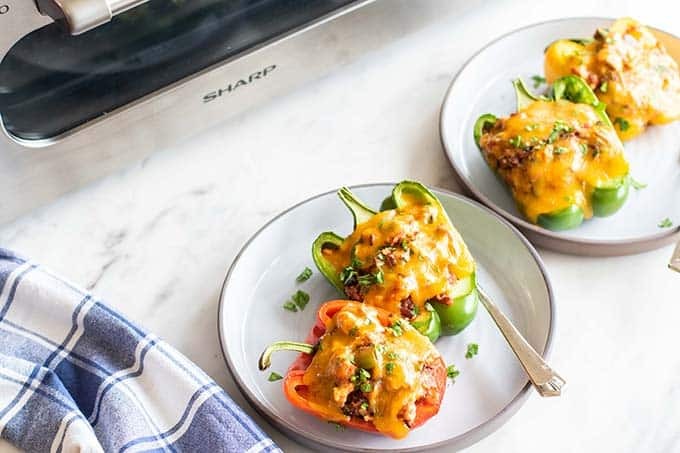 Bake in the Sharp Superheated Steam Countertop Oven for 15 minutes at 425º F. If using a conventional oven, preheat the oven to 425º F and bake the peppers for 22 minutes. Prepare the stuffing by first adding olive oil to a skillet over medium high heat. Saute minced onions, garlic and celery for about 10 minutes until softened. Add the spices and salt, and then the ground meat. Break up the meat as it cooks, and simmer until the meat has evenly browned. Add the tomato sauce, olives, and kale, and allow to simmer together for another 2-3 minutes. Add the stuffing to each pepper halve. 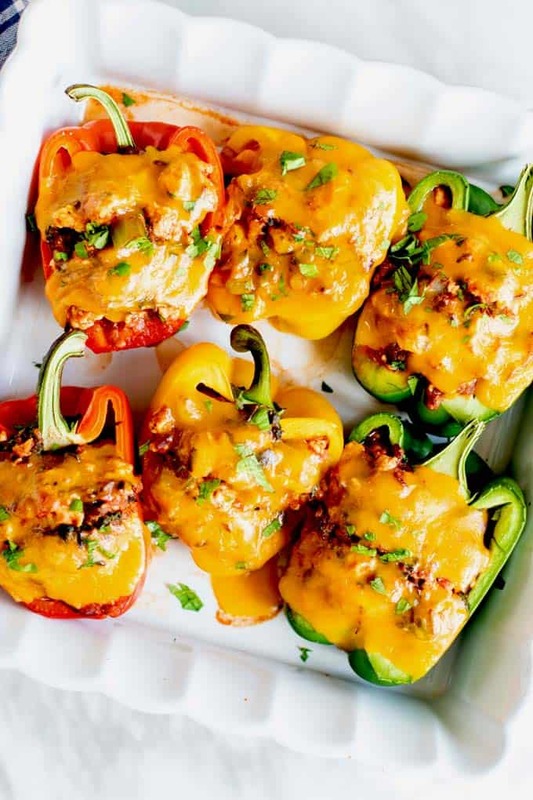 Top each stuffed pepper with a slice of cheddar cheese. Return to the Sharp Superheated Steam Countertop Oven to Bake/Reheat at 425º F for 15 minutes, or until the filling is bubbly and the cheddar is melted. If baking in a conventional oven, return to oven for 20-25 minutes. 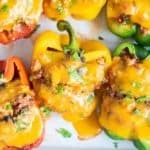 If making these in advance, stuff the peppers and top with cheddar, and then wrap and refrigerate until ready to bake. 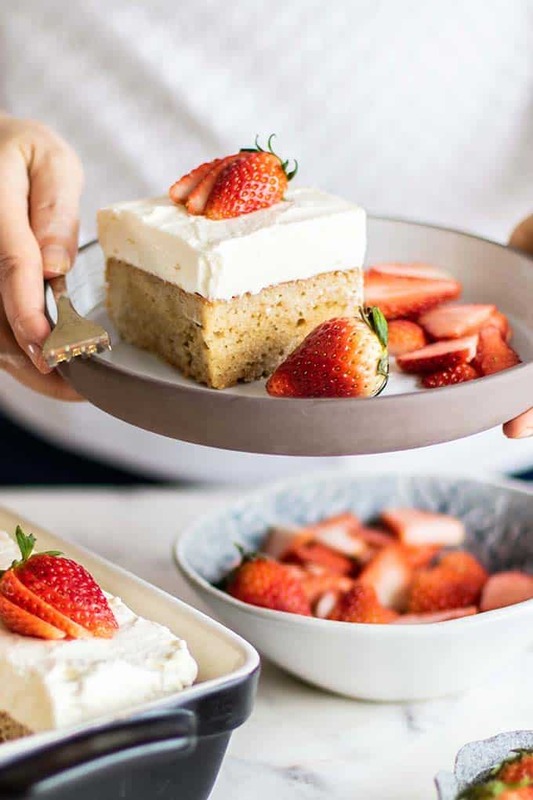 Since the mixture will be cold, up the baking time by 5 minutes in the Sharp Superheated Steam Countertop Oven, or 8-10 minutes in a conventional oven. This Stuffed Peppers post may contain affiliate links, meaning if you make a purchase, I will receive part of the sale as a commission. This helps me continue to bring you lots of fresh and inspired recipes!